Welcome to the production release of Detroit Diesel Diagnostic Link 7.08 software. This version is used to perform diagnostics on all vehicles equipped with EPA07 and EPA10 engines. The CD also contains Diagnostic Link 6.47 for performing diagnostics on DDEC and MBE electronic engines prior to the 2007 model year. 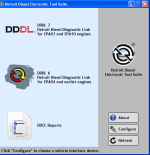 DDDL 7.08 will also install the Detroit Diesel Electronic Tools Suite utility which may be run to detect the software applications used with the engine you are connected to. This CD also contains a copy of DDEC Reports 7.02 which is compatible with all engine platforms from EPA98 to EPA10. The installation link for this version is located on the DDDL 7.08 main menu and is installed separately. It does not require a registration code.